"Don Quixote De La Mancha", the amusing crazily crusading hero, a caricatured figure of mingled fun and pathos, was the gallivanting knight out of time with his generation, who was so demented he thought he was still living in the days of ancient chivalry, so that he rode around gallantly on his old nag in a patchwork suit of armour with a pot for a helmet, faithfully followed on a funny little donkey by his fat and fuming "squire", Sancho Panza, gravely concerned for his odd master's safety during such ridiculous exploits as challenging windmills to battle whom he thought to be giants and rescuing fair ladies whom he supposed to be in distress, residing in an old inn he imagined to be a castle! He was really very noble, good-hearted and well-meaning, though somewhat misguided by his dementia and delusions of grandeur. However, in a way, he was a sort of fictional characterisation of his author's, Cervantes', own colourful life, a young Spanish idealist who went from job to job and battle to battle and bad to worse in his financial, military and marital difficulties. With a household of women to support, including his sisters, nieces, wife, mistress and daughter, he was frequently imprisoned for his debts, and wrote "Don Quixote" while in jail, about 1603 when he was 53 years of age, received nearly nothing for it, and died in poverty and near disgrace! Nevertheless, Cervantes must have been somewhat of a tarnished saint, since, while in five years of slavery in Algeria, the Hassan of Algiers claimed he led a charmed life and his ships and cities were safe as long as Cervantes was with him! 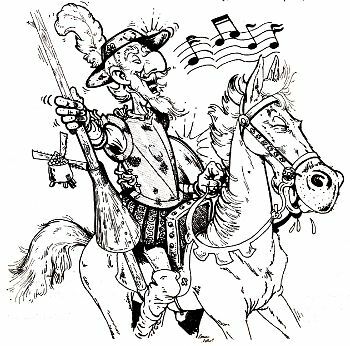 For an illegal duel of honour, he also spent years in exile in Rome as secretary to one of the Pope's Cardinals, and was considered a devout and faithful Catholic, though so often at odds with the System of his day!--How much like his own Don Quixote! The book itself is now considered the first and greatest of modern novels, and has been translated into more languages than any other book in the world outside the Bible! In fact, the first English translation was published in 1612, only one year later than the world-famed King James Bible of 1611! Set in Cervantes' native land of Spain long after the Crusades were over, "Don Quixote" revives the crusading spirit, searching for meaning and purpose to life, the nature and reality of truth, the relativity of judgement and values and innersprings of character with a constant delving beneath the surface of appearances and experience for a deeper significance and an all-pervading sense of the frailties of humanity. 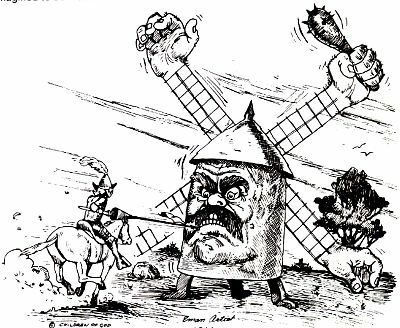 Don Quixote has even inspired movies, such as "The Man of La Mancha" and "The Adventures of Don Quixote". While viewing the end of the latter on TV, we were suddenly struck by his resemblance to ourselves and the reaction of his followers to his return to sanity on his deathbed. A poor young girl like one of you asks him sadly, "But how can you have been mad when you were so beautiful; so good and so poetic?" --To which he wanly replies, "I suppose wise madness is better than foolish sanity!" --TO which we suddenly received the witness of the Spirit with the first of the following verses, the remainder of which were inspired during the night. We had also just seen the awful "Death of Adolph Hitler", and could not help but see the tremendous contrast between the lives of these two madmen--one good and one bad, one loved and one hated. Yet the bad man was long considered sane by the world, and the good man has always been thought crazy! You see, it all depends on who is calling who mad! Look at Nitler (David's nickname for Richard Nixon) and his horrible atrocities in Vietnam, his attempted insane annihilation of a whole nation!--And yet, judging by his landslide re-election, the average insane American apparently considers him sane! But odd men trying to do good, like Quixote, Pied Piper, Rasputin, Moses, Simple Simon, Russia's "Idiot", Jesus, Paul and we, are so honest and loving we're insane! Where all were mad but he. Where he alone was free! They only brought him pain! Where only he was wise. If madness is to be glad! Than only be sane and sad. It makes my brain capsize! If wisdom is in vain. I'd rather be mad than sane! Our singing of songs is in vain. I'd far rather sing than complain! We should seek after worldly gain! And it brings to so many such pain! Oh give me my world of madness! Give me my songs in the rain! sadness! I would rather be glad though insane! It's their whole world that's in madness! 'Tis their whole world that's insane! Than their sanity, sorrow and pain. It was their world that was madness! They were the ones so insane! Was better than sorrow and pain. And let me be mad once again! They'll say he has gone insane! Than lost in their darkness and sane! So give me his joy and his gladness! I'd rather have joy than be sane! Who'd rather have sorrow and pain. It was he that was really sane! In spite of their sorrow and pain. So violent and mad and insane! Would you rather my joy, or their sadness? Would you rather my bliss, or their pain? So let me dream on if I'm dreaming! Oh let me drift on in my dreams! I'd rather be dreaming than screaming! I'd rather have dreams than their screams! So come let us dance in our gladness! Oh come let us dance in the rain! i'd rather be glad though insane! Than the pompous wise sane King of Spain! Quixote was happy, 'tis plain! A great knight was he in his brain! And thus he was freed from the strain. So give me. his world full of madness! And give me his world so insane! I'd rather be glad than be sane! They say there's no end to this madness! I say there's no end to their pain! Than all of their sorrow though sane. You say you have no time for madness? You have to go quick catch a train? While you slave again and again! So give me this Man of La Mancha! And sing me his happy refrain! Oh can you all see it, or can'tcha? That he was the one who was sane! Oh I am so weary with study! Of the reading of books there's no end! Can't you see their minds are all muddy? It's they who have gone round the bend! And wage their cruel wars without end! Don't let their pollution besmirch me! I'd far rather heal and to mend. "He's old Don Quixote again!" While they wreak their Hell amongst men! Who cares and so what?--Come let's go, Man! With me you've no idea what you'll see! So let's sing a song for Quixote! Let's sing a song for the free! For we're bound for Eternity! And a song for his Children so free! Who only brings sad misery. Who loved, drank, healed and swayed kings! He made off with all of their things! So here's to dear Alice's Mad Hatter! And the Walrus's cabbage and kings! If to children it happiness brings? So here's to the "Light in the Plaza"! So here's to the madness that sings! Than a girl who is happy with rings? So give us the mad Don Quixotes! Pied Pipers that make us to sing! With the joy our insanity brings! Than sane as the Devil and bad. I'd rather be mad and be glad! Where all are insane but we! Though you call it fantasy. While mine is unseen but more real! In this madness of gladness I feel. And it's I who have reality! That Heavenly sound, can you hear it? Do you know what such ecstasy means? No! You're mad, and you don't even know it! It's you who are living in dreams! It's I who am glad, and I show it! I dance on in spite of your screams. It's you who are living in madness! It's you who are really insane! And we'll have it again and again! Pied Piper, Rasputin and MO! Than have your insane world of woe! Their singing and dancing so free! With the love, truth and mercy he bears! Pied Pipers, Rasputins and MOs! Than all of your world full of woes! And a mind that with visions God blows! Your world of killing just chills me! l like living where anything goes! And all of our Heavenly tours! Than bats in my belfry like yours! And wish that my madness would end! Be full to the brim!